A unique and incredible approach to luxury, each and every all-new Ram Heavy Duty Laramie Longhorn model is masterfully crafted with authentic materials such as wood, leather, and metal in order to enact an original and immersive experience every time you step inside. 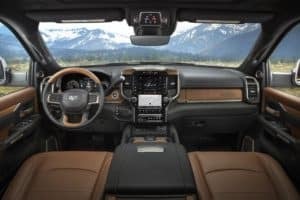 For starters, the dashboard is hand-wrapped in gorgeous full-grain leather and the armrests and door-panel coverings feature a Southwestern style. Covering the center console, seats, door-panel inserts and instrument panel, you’ll find a luxurious alligator skin-embossed material. Interior color options for this all-new full-size pickup include full-leather Black/Cattle Tan and Mountain Brown/Light Mountain Brown with contrast piping for a striking appearance. Externally, the new Ram Heavy Duty Laramie Longhorns all feature a chrome-slat grille which surrounds the ultra-bright premium LED headlights. 20-inch wheels are offered in a wide variety of different finishes so that the 2019 Ram Heavy Duty Laramie Longhorn is customized exactly to your liking. Does the all-new Ram Heavy Duty Laramie Longhorn sound like the right addition to your lifestyle? 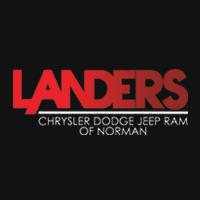 Just click here to visit Landers Chrysler Dodge Jeep Ram of Norman today!